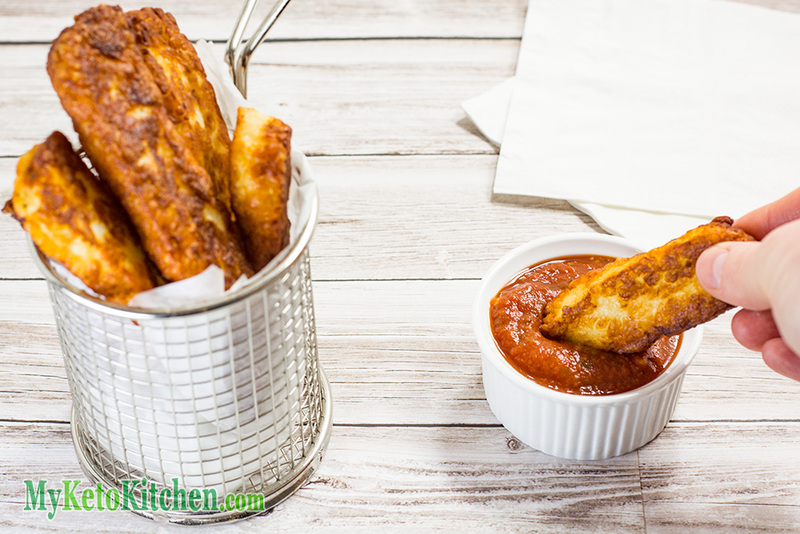 Keto Fries Recipe - Haloumi Cheese Fried Crunchy & Crisp! 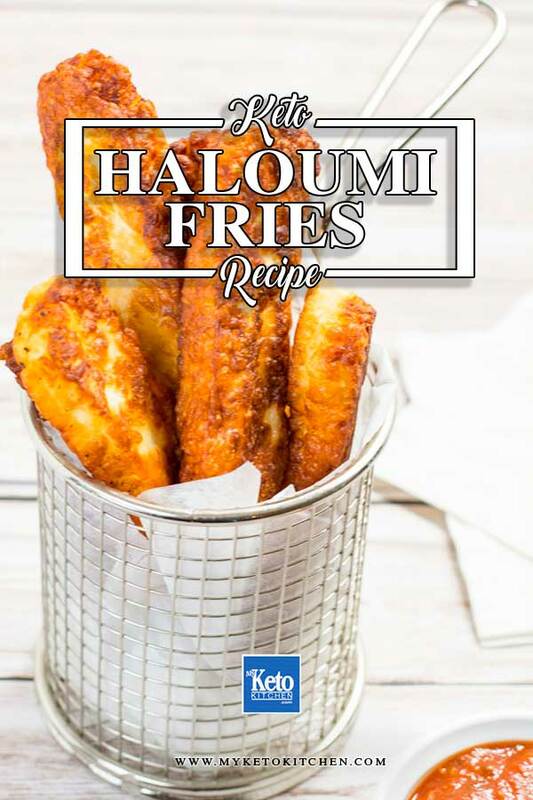 Home » Recipes » Keto Fries – Haloumi Cheese Fried Crunchy & Crisp! 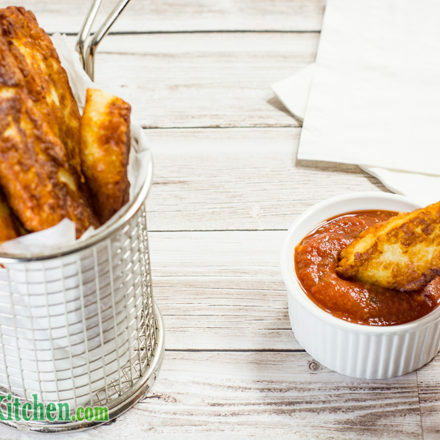 Keto Fries – Haloumi Cheese Fried Crunchy & Crisp! What better keto fries are than ones made entirely of cheese! Our crunchy haloumi cheese keto Fries recipe is crisp on the outside and soft in the center. When cooking with tallow or lard, it very important to use a splatter guard. 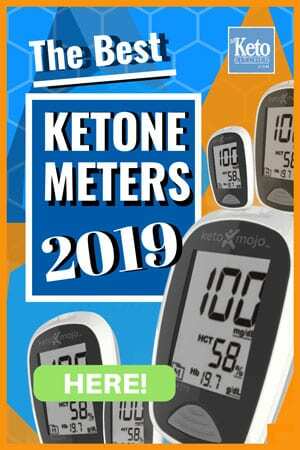 The fat spits and can burn you as well as coating your kitchen. This keto fries recipe makes 4 serves. Slice the halloumi into fries at least 7mm/0.3in thick and sit on paper towel to dry. Place the tallow into a large non-stick frying pan and place over medium to high heat. You want the tallow to be around 170C/340F. Gently add the halloumi pieces, I suggest using a pair of tongs as the tallow will spit hot fat. Once all the haloumi is added, cover the pan with a splatter guard. Cook the halloumi for about 2 minutes on each side, until golden brown and crunchy. Serve with a side of Low Carb Marinara Sauce for dipping. Keto Fries - Haloumi Cheese Fried Crunchy & Crisp! What better fries are there than those made entirely of cheese! Our Crunchy Haloumi Keto Fries are so delicious, crunchy and cheesy. Slice the haloumi into fries at least 7mm/0.3in thick and sit on paper towel to dry. Gently add the haloumi pieces, I suggest using a pair of tongs as the tallow will spit hot fat. Cook the haloumi for about 2 minutes on each side, until golden brown and crunchy. To make a larger batch of this crunchy Haloumi Keto Fries recipe adjust the serving amounts above. Keto Italian Meatballs – Basil & Parmesan Served with Zoodles!